We Eat Films / Featured / Movie Review: “Bully” – You need to see this. Movie Review: “Bully” – You need to see this. “Bully” is a documentary from Lee Hirsch and the Weinstein Company that takes an unabashed look at bullying like I have never seen before. This film follows Alex, Kelby, and Ja’Meya as they deal with their daily struggle of being tormented by their peers. It also includes the stories from the families of Tyler Young and Ty Smalley who both committed suicide due to bullying at the ages of 17 and 11. This movie is not to be taken lightly. These are real stories about real children who are tormented and bullied every single day for no other reason than for being a bit different than others. It is heartbreaking to see Alex (who was born at 26 weeks and as a result looks physically different) get hit repeatedly, threatened brutally, and name-called incessantly for nothing more than the way he looks. It is enraging to see the hate Kelby (a girl from a small town who came out as gay) has to endure just because of her sexual orientation. And to hear Ja’Meya’s story of how she was imprisoned for a bit and brought to court for an unbelievable amount of charges when she took a gun on her bus so she could feel strong enough to finally stand up to her tormentors is infuriating. The story of the kids who committed suicide are incredibly difficult to listen to. Either you can relate to their feeling or can’t even imagine the pain a person must be going through to want to end their life due to incessant belittling, this is where it becomes apparent that physical violence is not the only form of bullying that can seriously damage a person. The name calling, threats, and comments on how they should “just hang themselves” can plague a person’s mind and change how they think of themselves and effect their self image and, ultimately, their lives. When a member of the police force said the only way Ja’Meya could be justified in bringing a gun on her bus is if she was beaten everyday, is a showcase on how certain images of bullying need to change. The old adage of “sticks and stones may break my bones but names will never hurt me” does not apply anymore. Ok, sure, the school administrators, teachers, principals, etc. may not really know how to deal with bullying as they “can’t control what kids say.” But they should definitely stop what they’re doing as it’s ineffective and ends up favoring the bullies and making it seem like it’s the bullied child’s fault they’re getting tormented because they’re “not making an effort.” There is one particular Principal of Alex’s school that seriously needs a new job as she is clearly jaded when dealing with kids. She’s the one in the trailer that said the bus of kids were “good as gold” when she rode it one day. Of course they were good! An authority figure was there! It is so infuriating; when she said that line there was even an audible groan that rang through the audience. “Bully” only focuses on bullying in person, not online. It seems a little out of touch that way as cyber bullying is a pretty huge deal nowadays. It also seems to only focus on kids from smaller southern or mid-west American towns that doesn’t really give a wide-range of representation for kids from bigger cities. Also, the super positive, “we can change the world” ending seems a touch too optimistic. People should be optimistic that bullying can no longer exist, but people can’t change the world with just one movie and a few rallies. The people who need to see this movie is, well, everyone, but especially the bullies. There needs to be follow-up discussion after watching this to make kids more aware of their actions and words and how they can seriously harm another person. What also needs to be raised is the question on why there is so much hate. When a kid threatens to bring a knife to school and cut off another kid’s face, that’s legitimately psychotic. Where does that anger stem from? 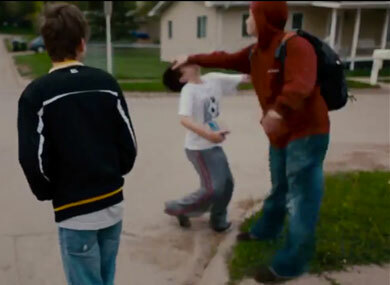 Everyone still needs to see this unabashed look at bullying and it’s effects on these children. This movie includes real footage of actual bullying from kids. Everyone was a kid once, and bullying is not a rite-of-passage, it is not “kids being kids”, it is something hurtful and this movie portrays that. These kids get a say in how they feel (or don’t feel) about things they have to endure daily and it is important to watch and understand their experiences to help children everywhere in situations like these. There are currently No Comments on Movie Review: “Bully” – You need to see this.. Perhaps you would like to add one of your own?